Why does the Bible contain so many stories of hurting people? Though their situations vary, their conditions don't. They have nowhere to turn. Yet before their eyes stands a never-say-die Galilean who majors in stepping in when everyone else steps out. Max Lucado reminds us that the purpose of these portraits isn't to tell us what Jesus did-but rather to remind us what Jesus still does. These high-quality hardback books are perfect for sharing the timeless and timely message of Max Lucado with your friends and family or perhaps to introduce a fan to a volume previously missed, or to connect Maxs amazing message of grace with someone brand new. Join us as we collect these jewels from the treasure box of Maxs million-copy best-sellers for a fitting display of insight and inspiration. 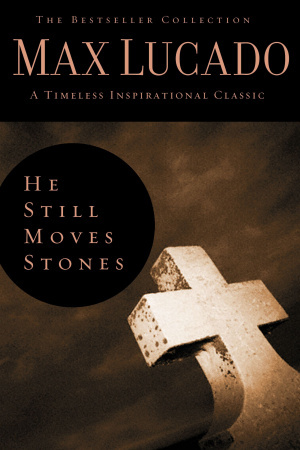 He Still Moves Stones: The Bestseller Collection by Max Lucado was published by Thomas Nelson in May 2009 and is our 18307th best seller. The ISBN for He Still Moves Stones: The Bestseller Collection is 9780849921339. Be the first to review He Still Moves Stones: The Bestseller Collection! Got a question? No problem! Just click here to ask us about He Still Moves Stones: The Bestseller Collection.